The prevalence of heart failure (HF) in the general population ranges between 0.4% and 2% and increases with age. The American College of Cardiology/American Heart Association guidelines for HF identifies 4 stages of HF: stage A, at high risk for HF but without structural heart diseases or symptoms of HF; Stage B, structural heart disease but without signs or symptoms of HF; Stage C, structural heart disease with prior or current symptoms of HF; and Stage D, refractory HF requiring specialized interventions. Patients in Stage A and B are ideal targets for HF prevention. Traditional risk factors for cardiovascular diseases (Stage A) are able to lead to maladaptive cardiac remodeling (Stage B) and over time to symptomatic left ventricular (LV) dysfunction. Early detection of subclinical LV dysfunction (systolic or diastolic) is pivotal because this progression can be positively influenced by early treatment. The assessment of LV filling pressures is a reliable tool for risk stratification in patient with HF. Given the limitations inherent to invasive measurements (cardiac catheterization), Doppler echocardiography, in particular, tissue Doppler imaging (TDI), has become the principal tool for estimation of LV pressure. Early diastolic transmitral velocity (E)/early mitral annular diastolic velocity (E') ratio (E/E') has been proposed as the most accurate echocardiographic predictor for evaluation of LV filling pressures in different clinical contexts. However, there are many limitations to the E/E' ratio estimation, in addition to its semi-quantitative definition of filling pressures (including, among others, annular site of measurements, a “wide” gray zone between 8 and 15, the role in healthy individuals, moderate-to-severe mitral valve disease, and presence of regional wall motion abnormalities). Nonetheless, TDI allows a contemporary longitudinal systolic function assessment (s' wave), which is affected variably and at different stages in HF. A dimensionless index combining both systolic and diastolic information, that is, E/(E' × S')average, was proposed as a reliable predictor of LV end-diastolic pressure in sinus rhythm patients, regardless of LV ejection fraction (EF), particularly in those with E/E'average between 8 and 15. Our purpose has been to assess the prognostic impact of E/(E' × S')average in a cohort of patients asymptomatic for HF (Stage A and B). We retrospectively analyzed a multicenter study designed by the Italian Society of Cardiovascular Echography (SIEC), the Disfunzione Asintomatica del Ventricolo Sinistro (DAVES) study, which enrolled 6679 asymptomatic HF individuals (Stage A and B) aged more than 18 years who were admitted to 19 echocardiographic laboratories for transthoracic examination as a screening evaluation in the presence of one or more cardiovascular risk factors. All laboratories were selected according to the operator's competence, level 3, in agreement with the American Society of Echocardiography (ASE) requirements. The study was approved by the local research ethics committees, in accordance to the Declaration of Helsinki. The study included participants without a clinical history of HF, according to inclusion criteria, with normal electrocardiography (ECG) tracings, and with normal clinical examination results in the presence of one or more cardiovascular risk factors. The definition of a normal ECG scan was according to Marriott's practical ECG normality criteria. All selected participants underwent a comprehensive two-dimensional echocardiographic study to evaluate LV functional and structural findings. Exclusion criteria were symptoms or clinical and instrumental signs of acute coronary syndrome or myocarditis, valvular heart disease (except mild forms not hemodynamically relevant), history of atrial fibrillation/flutter, anemia (hemoglobin <12 mg/dL in women and <13 mg/dL in men), renal failure (serum creatinine >1.3 mg/dL), and endocrine disorders (hypo- and hyperthyroidism, hyperaldosteronism). Pericardial disease, pulmonary hypertension, aortic diseases, and primary cardiomyopathy were excluded based on echocardiography. All participants provided written informed consent and detailed medical history, particularly on cardiovascular risk factors, comorbidities, and drug therapies. For study purposes, 6 cardiovascular risk factors were considered as follows: hypertension (systolic blood pressure > 140 mmHg, diastolic blood pressure >90 mm Hg, or in drug treatment), diabetes mellitus (fasting glycemia >7.0 mmol/L − 1 or in drug treatment), hypercholesterolemia (>200 mg/dL or in drug treatment), family history of cardiovascular disease (including coronary artery disease, cardiomyopathy, and other hereditary forms of cardiomyopathy), smoking (≥1 cigarette/day, cessation of smoking <10 years previously was still considered as smoking), and obesity (body mass index [BMI] ≥30 kg/m2). All patients enrolled in the study underwent a physical examination, 12-lead electrocardiogram, and comprehensive transthoracic echocardiographic examination, according to the standard protocol based on the ASE recommendations. Anthropometric measurements (weight, height) were obtained, and BMI was calculated (i.e., body weight in kilograms divided by height in meters squared). Blood pressure was measured twice at the right arm after a 10-min rest in the supine position using a calibrated sphygmomanometer and then averaged. Echocardiograms were acceptable when at least 80% of the endocardium was visible. Quantitative analysis was done, for each laboratory, by the same expert operator. Measurements of LV end-diastolic volume (EDV), end-systolic volume, and EF were performed using the modified biplane Simpson's rule as a mean of three cardiac cycles. EF <50% was used as a cutoff for abnormal LVEF (LV systolic dysfunction). The following diastolic parameters were assessed from the Doppler mitral flow and tissue velocities tracings: E-wave velocity, A-wave velocity, E/A, delta E/A (changes from basal to Valsalva maneuver), E-wave deceleration time, A-wave duration, and E/E' average. Pulmonary venous flow (systolic velocity, diastolic velocity, and reverse wave duration) and echo-derived estimated systolic pulmonary artery pressure (sPAP) were evaluated. Finally, diastolic function was classified according to recent joint ASE/European Association of Cardiovascular Imaging recommendations on diastolic functional evaluation. The grading scheme for diastolic dysfunction was mild or Grade I (impaired relaxation pattern), moderate or Grade II (pseudonormalized filling), and severe (restrictive pattern), or Grade III. Diastolic dysfunction was a dichotomous definition (yes/no for any of the previous 3 grades). A random sample of 5% was reanalyzed and reinterpreted in a single core laboratory facility by 2 independent observers (NRP: Nicola Riccardo Pugliese; IF: Iacopo Fabiani). The mean and standard deviation of variability between the two readings and by the same observer for the echocardiographic parameters were as follows: the intraobserver variability for EF was 63% ± 7% versus 65% ± 6% (mean ± standard deviation; P = 0.07), and the interobserver values were 63% ± 3% versus 66% ± 4% (P = 0.08). If the interobserver and intraobserver variability were considered in the identification of LV systolic or diastolic dysfunction, interobserver variability was 8.7% and intraobserver variability was 8.2% for systolic dysfunction, and interobserver variability was 8.5% and intraobserver variability was 7.7% for diastolic dysfunction. The methodology for E/(E' × S') ratio evaluation has been described previously. The TDI program was set in pulsed-wave Doppler mode. Motion of mitral annulus was recorded in the apical four-chamber view at a frame rate of 80–140 frames per se cond. A 4–5-mm sample volume was positioned sequentially at the lateral and septal corners of the mitral annulus. Two major negative velocities were recorded with the movement of the annulus toward the base of the heart during diastole, as follows: one during the early phase of diastolic myocardial velocity (E') and another during the late phase of diastolic myocardial velocity (a'). A major positive systolic velocity was recorded with the movement of the annulus toward the cardiac apex during systole. The peak myocardial systolic velocity (S') was defined as the maximum velocity during systole, excluding the isovolumetric contraction. All velocities were recorded for five consecutive cardiac cycles during end-expiratory apnea, and the results were averaged. All tissue Doppler signals were recorded at horizontal time sweep set at 100 mm/s. E/E' and E/(E' × S') were calculated using the average of septal and lateral mitral annular velocities. All 19 echocardiographic laboratories involved in the study agreed to follow-up the recruited patients. Follow-up of patients was performed using clinical controls (cardiologic visit), the hospital database, and phone contact to obtain information on clinical data and adverse events. The present study considered the following composite endpoint: all-cause death, acute myocardial infarction, stroke, and HF exacerbation. For the diagnosis of myocardial infarction and stroke standard laboratory, ECG or examination criteria were used. HF exacerbation was defined as dyspnea, accompanied by pulmonary edema or congestion on chest X-ray requiring hospitalization. Continuous variables are presented as mean ± standard deviation if normally distributed or median and interquartile range (IQR, 1st–3rd quartile) if not normally distributed. Continuous variables from 2 sets of data were compared using Student's t-test or Mann–Whitney U-test when non-Gaussian. Categorical variables are presented as percentages and were compared using the Chi-square test. Clinical and echo-derived parameters were included in a Cox proportional hazard model using univariate and stepwise multivariate procedures to evaluate the association to the composite endpoint (only the first event was taken into account). Significance of 0.05 was required for a variable to be included in the multivariate model, while 0.10 was the cutoff value for exclusion. According to a stepwise selection process, variables were entered into, or removed from, the regression equation on the basis of a computed significance probability value. Hazard ratios with corresponding 95% confidence intervals (CIs) were estimated. The parameters included in the Cox model were established a priori to assess how conventional risk factors (both clinical and echo-derived parameters) were able to identify patients at risk for events. The predictive accuracy of proposed parameter for composite endpoint was assessed from receiver operating characteristics curve, including area under the curve (AUC) and 95% CIs. Statistical significance was set at P < 0.05. All data were analyzed using SPSS software (version 13.0; SPSS, Inc., Chicago, IL, USA). From the DAVES database, we retrospectively selected 337 patients where E/(E' × S')average was derivable, excluding patients in whom TDI measures were not available or accurate and patients lost to follow-up. 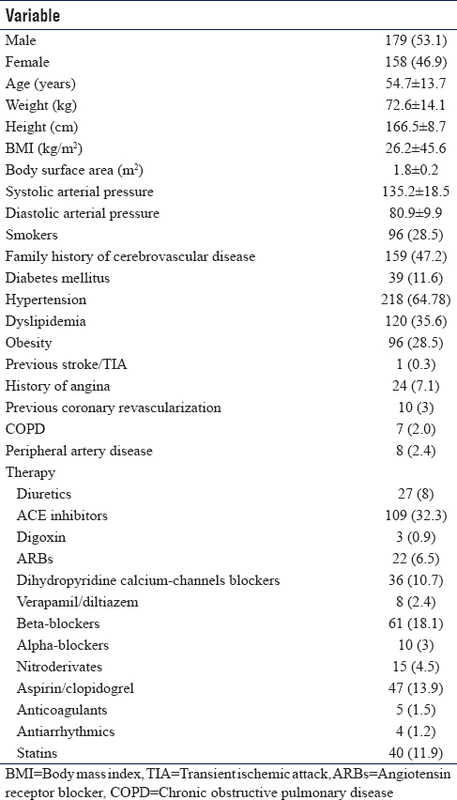 [Table 1] summarizes clinical characteristics of study population, together with risk factors and comorbidities. A clinical history of stable ischemic heart disease (SIHD), defined as a history of angina or previous coronary revascularization, was found in 29 patients (8.6% of the population). Echo-derived parameters were summarized in [Table 2]. Only 41 patients (12.2%) presented a systolic dysfunction (EF <50%) classified as mildly abnormal LV function (EF >40%), while 116 (34.4%) showed diastolic dysfunction (1st degree or more). E/(E' × S')average was 1.4 ± 0.8, with S' 7.4 ± 2.4 cm/s and E/E'average9.4 ± 3.4. Significant correlations were observed between E/(E' × S')average and both clinical and echocardiographic parameters [Table 3]. After a 22-month median follow-up (IQR, 30–47 months), there were 42 events: 2 cardiac death (5%), 3 noncardiac deaths (7%), 3 acute myocardial infarctions (7%), 1 stroke (2%) and 33 HF hospitalizations (79%). 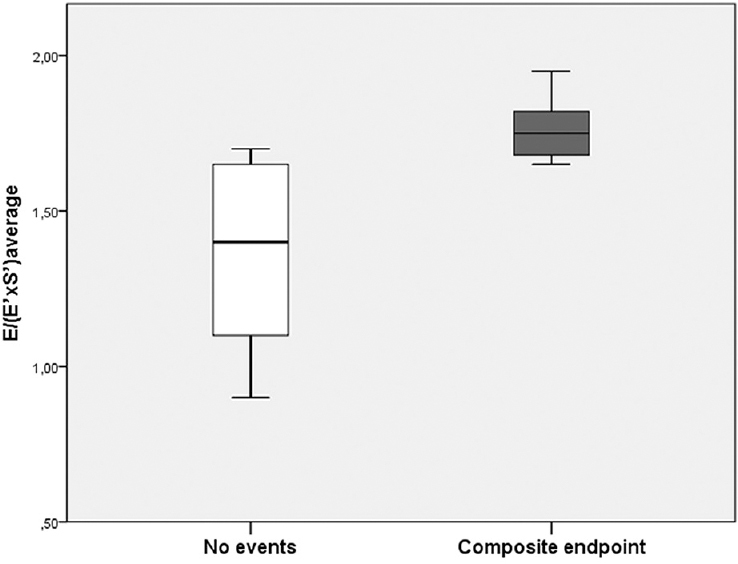 In patients with events, E/(E' × S')average resulted 1.77 ± 0.11 (vs. 1.36 ± 0.28 in patients with no events, P < 0.001); [Figure 1]. To test the association with events, we performed univariate Cox-regression analysis of clinical and echo-derived parameters, including weight, BMI, systolic and diastolic arterial pressure, smoke, family history of cerebrovascular disease, diabetes mellitus, hypertension, dyslipidemia, obesity, classes of drugs, systolic and diastolic dysfunction, LVEDV index, atrial end-systolic area, estimated sPAP, E, E', and S'. Afterward, univariate significant predictors (age, gender, SIHD, E/(E' × S')average, and E/E') were entered into a multivariate analysis to observe the occurrence of the composite endpoint. E/(E' × S')average (P < 0.001, HR = 2.13, CI 95% 1.41–3.22), male gender (P = 0.03, HR = 1.25, CI 95% 1.07–1.89), and age (P < 0.001, HR = 1.08, CI 95% 1.02–1.13) resulted independent predictors [Table 4]. The optimal cutoff for E/(E' × S')average in predicting the composite endpoint was 1.68 (AUC 0.81, CI 95% 0.73–0.90; P < 0.01; sensitivity 78%; specificity 91%). Identification and treatment of asymptomatic HF individuals, with prevention of its progression, has been the objective of the SIEC, who planned a multicenter perspective study on asymptomatic LVEF to analyze its prevalence and the role of echocardiography in the diagnostic and prognostic strategy. In the present study, we analyzed in asymptomatic patients (Stage A and B) for HF, the prognostic impact of a novel TDI-derived index, combining conventional Doppler echocardiography of the transmitral flow (E velocity) with 2 TDI parameters (E' and S'). Systolic dysfunction is, together with diastolic impairment, one of the primary drivers for HF development. Previous studies already confirmed the prognostic impact of systolic and diastolic dysfunction in HF population. Moreover, as previously demonstrated by our group, even in participants with apparently normal systolic/diastolic function at echocardiography, single or multiple risk factors play a significant prognostic role. One of the reasons could be the impact of these risk factors on the interplay between systolic and diastolic function. That's why the assessment of an index capable of a comprehensive LV function evaluation could help in evaluating the complex pathophysiological mechanism that leads to overt HF. In fact, a clear separation of relaxation from contraction is difficult, and a better approach would be to consider them together as part of a continuous cycle., The energy generated during systole is stored in myocardial collagen fibers, and following relaxation, the ventricle uncoils, creating LV suction. There seems to be a relation of proportionality between decline in contractile function and reduction in recoil, with parallel changes in the extracellular matrix. Some authors consider that systolic function is, in fact, one of the most important determinants of diastolic function. LV diastolic dysfunction is usually the result of impaired LV relaxation with or without reduced restoring forces (and early diastolic suction), and increased LV chamber stiffness, which increases cardiac filling pressures. E/E' has been proposed as the best single-Doppler predictor for evaluating LV filling pressure. However, there are some limitations of the E/E' to estimate LV filling pressure, in particular, it is reliable for predicting elevated LV diastolic pressures only in patients with E/E' >14 and in participants with preserved EF, without regional wall motion abnormalities. The analysis of LV long-axis function in TDI (S', a potential early indicator of systolic impairment) demonstrated valuable additive information for the noninvasive assessment of LV filling pressure. Notably, E/(E' × S')average demonstrated to be a reliable predictor of LV end-diastolic pressure in sinus rhythm patients, and it was superior to E/E', E', S', or E, regardless of LV EF, particularly in those with E/E' between 8 and 15 (the so-called gray area in diastolic dysfunction grading) and in those with regional dysfunction. In addition, this parameter resulted useful also in predicting new-onset atrial fibrillation in patients with HF, in sinus rhythm, regardless of EF, and it was the strongest predictor of new-onset AF compared to several other echocardiographic parameters (conventional and TDI parameters), clinical variables, and plasmatic N-terminal pro-B-type natriuretic peptide (NT-pro-BNP) levels. Recently, the prognostic value of E/(E' × S')average was demonstrated in patients with HF with preserved and reduced EF: the dimensionless index was the only independent predictor of future cardiovascular events (cardiovascular death, nonfatal myocardial infarction, and HF exacerbation) in both HF populations. According to the theory of the continuous cycle, the present study demonstrates that E/(E' × S')average has a significant prognostic impact also in a population of asymptomatic HF patients. In particular, E/(E' × S')average is the strongest predictor variable in comparison to standard LV systolic and diastolic evaluation, even considering E/E', suggesting that this composite index actually provides supplementary information. Noteworthy, the prognostic impact of the index was independent and additive respective to age, gender, and SIHD. Moreover, we propose a E/(E' × S')average cutoff of 1.68 for predicting adverse events in clinical practice (sensitivity 78%, specificity 87%). Our cutoff point is consistent with the value described by Dragulescu et al. for the assessment of LV end-diastolic pressure, underlining the importance of an accurate estimation of LV filling pressure in terms of prognosis. Finally, the strength of this parameter is its ease of use, thanks to its availability in most of the modern echo machines, making it readily applicable for the bedside assessment of patients. A study limitation was the use of composite outcomes. The use of standard echocardiographic assessment instead of more sophisticated methods (e.g., strain imaging) could be considered both a limitation and a strength of the study. The limitation is that strain imaging has proved to be more sensitive for detecting subclinical abnormalities of both systolic and diastolic function. Nevertheless, the strength is that the present study was focused on the utility of currently established and widely available echocardiographic techniques. The low prevalence of adverse events described in the present study, because of the study population size and length of follow-up, could be considered another limitation. However, this is not totally surprising if we consider patient inclusion criteria (asymptomatic HF). Another limit of the study is represented by the exclusion of a significant share of the initially enrolled population in the DAVES, due to the inadequacy of TDI measurements. Finally, we did not evaluate natriuretic peptide (B-type natriuretic peptide and NT-pro-BNP) levels. In fact, recent works demonstrated that increased concentrations of both these biochemical markers could accurately detect asymptomatic LV systolic and diastolic dysfunction., This promising novel parameter should be tested in larger clinical trials to better delineate his potential role in clinical practice. E/(E' × S')average has a prognostic impact in patients asymptomatic for HF, incremental to standard clinical and echo parameters, resulting a useful and promising diagnostic tool for clinical management. Yancy CW, Jessup M, Bozkurt B, Butler J, Casey DE Jr., Drazner MH, et al. 2013 ACCF/AHA guideline for the management of heart failure: Executive summary: A report of the American College of Cardiology Foundation/American Heart Association task force on practice guidelines. Circulation 2013;128:1810-52. Chen J, Normand SL, Wang Y, Krumholz HM. National and regional trends in heart failure hospitalization and mortality rates for medicare beneficiaries, 1998-2008. JAMA 2011;306:1669-78. Paulus WJ, Tschöpe C, Sanderson JE, Rusconi C, Flachskampf FA, Rademakers FE, et al. How to diagnose diastolic heart failure: A consensus statement on the diagnosis of heart failure with normal left ventricular ejection fraction by the heart failure and echocardiography associations of the European society of cardiology. Eur Heart J 2007;28:2539-50. Nagueh SF, Smiseth OA, Appleton CP, Byrd BF 3rd, Dokainish H, Edvardsen T, et al. Recommendations for the evaluation of left ventricular diastolic function by echocardiography: An update from the American society of echocardiography and the European association of Cardiovascular imaging. J Am Soc Echocardiogr 2016;29:277-314. Park YS, Park JH, Ahn KT, Jang WI, Park HS, Kim JH, et al. Usefulness of mitral annular systolic velocity in the detection of left ventricular systolic dysfunction: Comparison with three dimensional echocardiographic data. J Cardiovasc Ultrasound 2010;18:1-5. Mornos C, Cozma D, Rusinaru D, Ionac A, Maximov D, Petrescu L, et al. A novel index combining diastolic and systolic tissue Doppler parameters for the non-invasive assessment of left ventricular end-diastolic pressure. Int J Cardiol 2009;136:120-9. Carerj S, Penco M, La Carrubba S, Salustri A, Erlicher A, Pezzano A, et al. The DAVES (Disfunzione asintomatica VEntricolare sinistra) study by the italian society of cardiovascular echography: Rationale and design. J Cardiovasc Med (Hagerstown) 2006;7:457-63. Peterson LR, Waggoner AD, Schechtman KB, Meyer T, Gropler RJ, Barzilai B, et al. Alterations in left ventricular structure and function in young healthy obese women: Assessment by echocardiography and tissue Doppler imaging. J Am Coll Cardiol 2004;43:1399-404. Carerj S, La Carrubba S, Antonini-Canterin F, Di Salvo G, Erlicher A, Liguori E, et al. 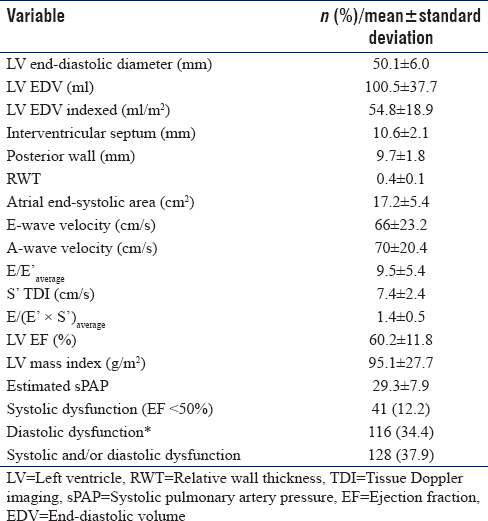 The incremental prognostic value of echocardiography in asymptomatic stage a heart failure. J Am Soc Echocardiogr 2010;23:1025-34. Marwick TH, Raman SV, Carrió I, Bax JJ. Recent developments in heart failure imaging. JACC Cardiovasc Imaging 2010;3:429-39. Yip G, Wang M, Zhang Y, Fung JW, Ho PY, Sanderson JE, et al. Left ventricular long axis function in diastolic heart failure is reduced in both diastole and systole: Time for a redefinition? Heart 2002;87:121-5. Leite-Moreira AF. Current perspectives in diastolic dysfunction and diastolic heart failure. Heart 2006;92:712-8. Mornos C, Petrescu L, Cozma D, Ionac A, Pescariu S, Dragulescu SI, et al. A new tissue doppler index in predicting future atrial fibrillation in patients with heart failure. Arq Bras Cardiol 2011;97:468-77. Obokata M, Takeuchi M, Negishi K, Ohte N, Izumo M, Yamashita E, et al. Relation between echocardiogram-based cardiac parameters and outcome in heart failure with preserved and reduced ejection fraction. Am J Cardiol 2016;118:1356-62. Lubien E, DeMaria A, Krishnaswamy P, Clopton P, Koon J, Kazanegra R, et al. Utility of B-natriuretic peptide in detecting diastolic dysfunction: Comparison with Doppler velocity recordings. Circulation 2002;105:595-601. Wei T, Zeng C, Chen L, Chen Q, Zhao R, Lu G, et al. Systolic and diastolic heart failure are associated with different plasma levels of B-type natriuretic peptide. Int J Clin Pract 2005;59:891-4.